At Laser Plumbing Christchurch East, we understand how critical it is to have your most important equipment working at its best, and know what is at stake when things break down. This is why we provide 'Totally Dependable' plumbing services for industrial and civil projects, servicing all of Christchurch's suburbs and surrounding areas. Laser Plumbing Christchurch East is here to help when you need an immediate response, quality workmanship and friendly plumbing advice. The needs of specialised industry companies are wide and varied. Whether your business specialises in agriculture, horticulture, mining or manufacturing and assembly, Laser Plumbing Christchurch East should become your plumbing contractor of choice. We have your industrial plumbing requirements covered for your new or existing building, whether it’s to improve your drainage system to prevent flooding or installing a fire protection system for the safety of your employees. 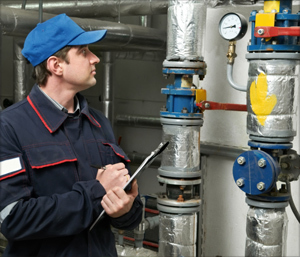 We know that maintenance and servicing is vital to ensure your workplace is safe and operating at maximum efficiency. We can set up a preventative service schedule to avoid the expensive costs of break downs. When unforeseen circumstances arise and when things go wrong, you can rest assured Laser Plumbing Christchurch East will respond quickly to get you up and running again. You can rely on us to make ourselves available when you need us. We have experienced plumbers who are trained and equipped to install any industry specific equipment that you may require. Our commitment to a high standard of health and safety means we ensure our plumbers are up to date with current health and safety practices. We always do our best to ensure all sites are safe before proceeding with any work. Laser Plumbing Christchurch East is constantly training in new technologies and is happy to provide any advice on the next big thing in your industry. Whether it’s new installations, designing a solution or programmed facilities maintenance, please contact Laser Plumbing Christchurch East for a ‘Totally Dependable’ service.